Ascending Butterfly: Wednesday, November 11, 2009 - Today's Words of Inspiration and SEVEN giveaways! Wednesday, November 11, 2009 - Today's Words of Inspiration and SEVEN giveaways! 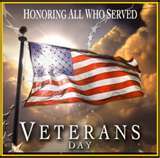 To the men and women who make so many sacrifices in service to our country, Ascending Butterfly says Thank You! The time you spend away from your loved ones is a tremendous sacrifice. The risks you endure when you 'suit up' for work each and every day must be scary. For the souls who have been lost in battle we pray you rest in peace. And for their families and friends we wish you strength and send our appreciation. A Great Site to check out today is Military.com. You should also take out a moment to visit Legacy.com. There is a 'Moving Tributes' page which features videos dedicated to those killed in Afghanistan and Iraq. The tributes are very moving and a very wonderful reminder that it is important to spend some time honoring the fallen. These are the faces that belong to friends, neighbors, brothers, sisters, nieces, nephews, sons, daughters, moms and dads! Great sales is not what this day was originally intended to be about! If there is a Vet in your home, please remember to hug them especially tightly today! Don't forget to enter the 7 great giveaways on the upper right hand side of the page! The holiday push is going to be fast and fierce on Ascending Butterfly, we will be offering multiple giveaways all through the season! It's just our way of saying Thank You! for choosing to spend part of your day with Ascending Butterfly. We are really happy you landed HERE! ALERT: ENDING TODAY! - Don't forget to get in your entries for the Butterfly Pendant Necklace, this giveaway closes TODAY, enter HERE NOW!! !